The thermal camera PCE PI160 is a radiometrical scanning infrared camera system, designed to capture and display temperature- based images and temperature profiles of objects. The thermal camera PI160 fulfills highest technological standards: Not only it is equipped with a 2.0 USB interface, but it also features a real-time imaging of 120 images per second. Furthermore for a thermal camera that is not only stationary applicable but also fitted for portable operation, it is well priced. The thermal camera provides thermal images in real time with a frequency of 120 Hz. By means if snap shots or recording of videos the images can be archived. The thermal camera PCE-PI160 is based on a small bolometer (UFPA) with 160 x 120 pixels and a pixel size of 25 x 25 µm. The high thermal sensitivity provides very detailed temperature images. Therefore the thermal camera PCE.PI160 is qualified for application in areas of research and development, at check-points, process automation or for portable images in general. 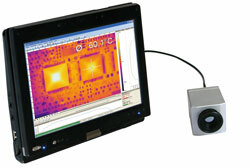 By means of a USB cable the thermal camera can be connected to a computer and is immediately ready for further operation. The temperature data of the thermal camera will be transferred to the provided software PCE PI Connect after converting them into thermal images. 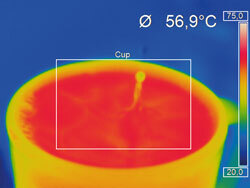 The software also manages remote controlling the thermal camera. Furthermore the camera features a line scan camera function allowing to monitor moving objects during processing. With a weight of only 195 g the thermal camera PI-200 / PI-230 has a very light and compact design without comparison. Combined with a tablet PC the thermal camera can be also applied for precautious maintenance or thermal imaging premises'. 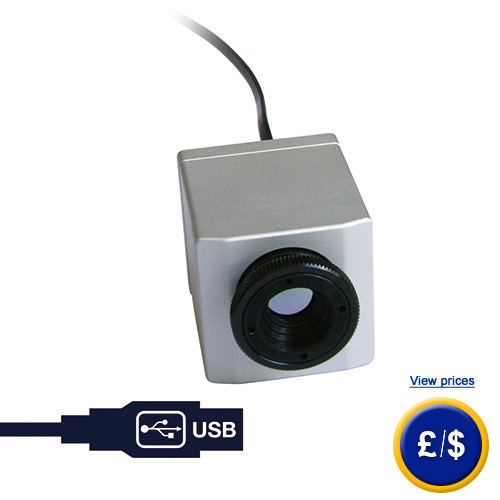 Thus the thermal camera combines portable and compact application with stationary operation. Some of the application ranges are e.g. electronic development, process controlling during extruding, process controlling during calendaring or development and processing of solar technology, LCD flat screens or any other electronic equipment as well as the development of mechanical parts etc. Depending on its operational purpose there are various kinds of objectives are purchasable that are listed below with their serial number. In case that you should have more questions regarding the infrared camera PCE PI160, please read the following technical data, use our contact form or call us: UK customers +44(0) 23 809 870 30 / US customers +1-410-387-7703. Our technicians and engineers will gladly advise you regarding the infrared camera or all other products in the field of Control Systems, Laboratory Equipment, Measuring Instruments or Scales and Balances of PCE Instruments Ltd.
Portable and stationary: PI160 connected to a tablet PC.